How to play the new Egg Druid deck in the early days of Rastakhan's Rumble. 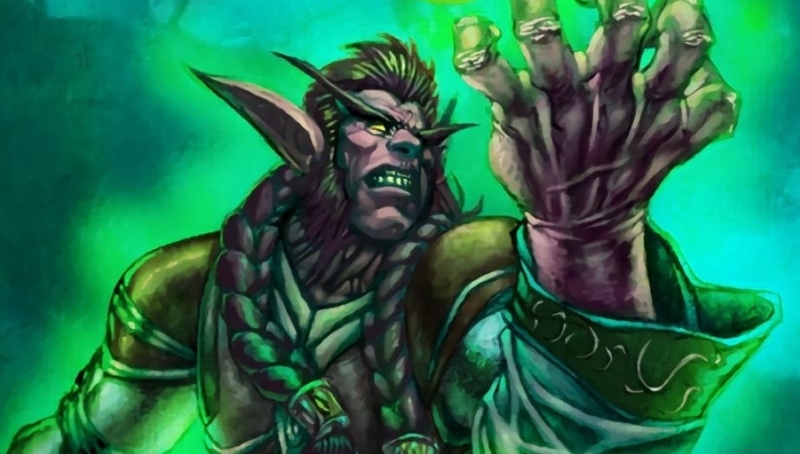 Our Edd Druid deck list guide features a deck list currently being used in the early stages of Rastakhan’s Rumble. Over time, our Egg Druid guide will later be updated with Mulligan advice, card combos and strategy tips. Egg Druid is a Hearthstone deck that combines many of the buff cards that are exclusive to the class with Deathrattle minions that summon extra creatures upon death. This all serves to create sticky boards that are difficult for your opponent to completely clear. Under the constant threat of attack whether they decide to kill your minions or not, you’ll be able to steadily whittle them down over the course of the match. The name Egg Druid comes from cards such as Scarab Egg that need to be ‘broken’ before you can get the full effect from them. The Druid class is perfectly placed to take advantage of these minions, with hidden value thanks to buffs such as Mark of the Wild that enable you to proactively break them to gain the Deathrattle bonuses. In this guide we’ve gathered together one of the best deck lists for Egg Druid available right now for the launch of Rastakhan’s Rumble. We’ll also be taking a closer look at how you can play the deck effectively while highlighting all the most important card combos. As the meta develops over the next few weeks, this guide will be updated with current deck lists and more specific advice for playing the deck on the ranked ladder, so keep your eyes on this page for more information! This is the Egg Druid deck list that J4CKIECHAN has put together for Rastakhan’s Rumble. We’ll be sure to update it with any card changes as and when they occur. The game plan for Egg Druid is quite straightforward: play your cheap minions, empower them with buff cards and use them to trade into your opponent’s creatures while still maintaining a board presence, thanks to the extra minions summoned on their Deathrattle effects. Scarab Egg and Eggnapper are the two cards that give the deck its name, so they will be the main targets for your buff cards. For example, if you hit either of them with Mark of the Wild and then kill them off, the additional minions they spawn will stick on the board. This can give you a tempo advantage over your opponent, and then you can make them even stronger with further buffs. You can take things one step further by stacking multiple effects on a small board of minions to really flood the battlefield after they die. Soul of the Forest can add a Deathrattle effect that will make minions summon 2 / 2 Treats after they die, thus putting even more pressure on the board. It leaves your opponent with a tough decision: do they leave the minion as it currently is, or do they pop the Deathrattle effect to remove the current threat ,but face dealing with much more on the board afterwards? - Both Scarab Egg and Eggnapper will spawn additional minions when they are destroyed through their Deathrattle effects. The former may have zero attack, but you can proactively trigger this effect by buffing its attack power with spells or other minions. - On that point, you can use Mark of the Wild to give a minion + 2 / + 2 and Taunt. This is perfect for Scarab Egg as it will give it the attack power to trade with your opponent’s minions or force them to trade into it, thus triggering the Deathrattle effect. - You can add more Deathrattle effects to your minions through Soul of the Forest. Anything that dies under this effect will spawn a 2 / 2 Treant upon death, ensuring some of your board stays intact. - Both Defender of Argus and Fungalmancer buff the stats of the minions adjacent to them. If you can, position either card between two minions already on the board to get the maximum effect from their Battlecry. - Dire Wolf Alpha also buffs adjacent minions, but to a lesser extent than the above cards. It’s only one attack but is sometimes enough to trade up into a foe’s creature or enable you to break Scarab Egg. - When you have a wide board, you can consider finishing off your opponent with Savage Roar. This spell will grant + 2 Attack to all characters for one turn. The character designation is important as that also includes your own hero, so don’t forget about this damage that could take you into lethal range! - Flobbidinous Floop is a powerful legendary in this deck as it transforms into a 3 / 4 version of the last minion you played. If that was a Scarab Egg, you can get the same Deathrattle effect without having to worry about buffing the minion first! - One way to go wide on the board very quickly is with Living Mana, which will transform all of your unspent mana crystals in 2 / 2 minions. Be warned, you lose that mana crystal while the creature is in play, though it will return to you upon death.